Do you have a big family dinner at your house for Easter? Or, do you keep things simple and avoid going to too much trouble when it comes to food on that day? Either way, a nice fluffy loaf of bread, or rolls and maybe some cinnamon rolls to eat with all of those eggs in the morning is something that is always welcome. The nice thing about baking bread is that you can bake it in advance of the day that you need it and then have it for dinner or a light meal. Over time, on our blog, we have posted some pretty delicious recipes for bread that would be perfect for an Easter meal. On today's Friday Faves #96, we thought we would share some of our favorite loaves with you. We will supply the buttons that lead to those recipes so that you can have them at your fingertips when you are ready to start baking. You're welcome! These loaves of Easter Bread would make awesome gifts to share with friends this Easter season, too! This Braided Bread is one of the favorite loaves that I learned to bake early in my marriage. It is easy and quick as far as breads go and very good. You can read about the story behind this bread on this post. Click the button to go straight to the recipe. This Portuguese Easter Bread is a recipe adapted from my Sister-in-Law's family recipe. It is a big part of my memories of her. Read about the traditions behind this Portuguese Braided Bread as related by my sister-in-law on this link. I think I could also form this bread like the braided loaf and tuck the eggs in the braid. That would look pretty! This is the best and easiest free form baguette type loaf that you will find. We shared it awhile back and it definitely deserves another look just in case you missed it! I shared this recipe a couple of years ago. It was given to me by my friend, Anita who got it from a friend of her's named Julie. It is so simple and delicious to make. I feel like many of you may have missed this amazing recipe. Check out the original post here. I fell in love with these rolls the first time I made them. Light and delicious rolls like these are perfect for Easter. I made cinnamon rolls out of part of this roll recipe that came out really good as well! www.3winksdesign.com/home/fluffy-and-delicious-potato-rollsThis post will show you how to do both. The recipe is on there, too. If you like to eat cinnamon rolls, but you also like to eat vegan, here are some quick vegan cinnamon rolls that Maddy shared. These rolls were shared on a Friday Fave over 2 years ago! You can see what the other favorite things were by going to this post. Or, click the button to go to the recipe. Now I have to decide which bread I will make for this year! Let me know if you are baking bread this Easter. We hope you might give one of our loaves a try! Happy Baking! 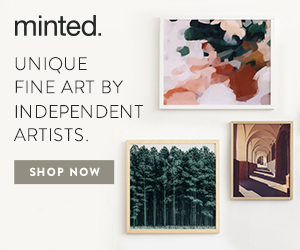 ​Anniversary Event: Enjoy 15% Off Site-wide and 25% Off Save the Dates with code ELEVEN at Minted! I had 4 very ripe bananas that needed to be dealt with and I thought Banana Muffins would be nice. Often, Maddy stops by after work and looks for a snack and since she eats vegan, I thought I'd try making a vegan version of Banana Muffins this time! I am so pleased with how moist these muffins came out! And, they make a delicious breakfast this time of year, especially enjoyed with a Hot Cocoa Bomb! Our winter mornings here in Phoenix are still in the 40s, I know many of you are suffering with lower temps than that! Just having these Vegan Banana Muffins baking in your oven add such a warmth and a cozy smell to the house that helps you get through any winter blues! When I put these in the muffin tin, I topped them with a bit of brown sugar, oats and a dash or two of cinnamon. It turned out to be just the right topping on these tasty Banana Muffins. Since this recipe used all 4 of my ripe bananas, that's why they came out so moist! Instead of eggs, I used the vinegar and baking soda method to get the rise and softness that I wanted. When my husband tried one the first thing he noticed was how moist they are. No one likes a dry muffin! Maddy said she will come try one today. I will let you know her verdict when she tries one! I don't think she will be disappointed! So, if you would like to give them a try, here is my recipe for Vegan Banana Muffins! *If you like the Valentine place mats in these photos, you can find how to make them on this post! *That cute owl mug was a gift from my friend Joanne! Don't you love it? Sorry, it is currently unavailable on Amazon, but here is a cute one in a similar color. Hurray Fall! The time of year when there are things baking and leaves falling and lots of cool looking veggies in the stores and backyard campfires and eating chili and cornbread! Wait! Let's stop right there with the cornbread part. I have not really been a big fan of cornbread throughout my life. It is often dry and crumbly, which I can deal with in chili but not in any other way. Or, it has jalapenos mixed in it, which makes it too spicy for my taste. Then, for awhile I made the cakemix kind of cornbread, which made it more moist, and sweet, but let's face it, I was eating cake with cornmeal in it. So, nothing really satisfied me when it came to cornbread. Now, fast forward to this year and our annual church Halloween party and chili cook-off. I signed up to bring cornbread. Don't ask me why. It had become a challenge to me, I guess. I started thinking and thinking about what I could do to make a really good cornbread. Then, I realized that in my refrigerator I had some leftover winter squash begging to be used. It was from the turban squash I had used in this recipe. I wondered to myself if that squash would work in my cornbread? Oh My Goodness! I have created the best cornbread ever! First of all, the turban squash has a very mild flavor, so the taste is very subtle in the cornbread. But, it added such moistness and the bread came out fluffy and amazing to eat with chili. As a side bit, it can't hurt to sneak a little vegetable into your cornbread! If you don't have some puree already ready to be used in your recipe, I suggest baking your squash for about an hour or so at 350 degrees, then cutting it open, scooping out the seeds and pureeing the flesh. It is super easy to do. (It is especially nice to do on a rainy day because it really makes you feel like you are doing an autumnal thing.) You don't have to use just turban squash. Butternut, acorn or even pumpkin should do the trick. The color and flavor may vary slightly though. This recipe works well in a 11"x7" brownie sized pan.